The 2011 NBA Playoffs are underway. If you enjoy listening the NBA action, or don’t have a way to watch the game, here are a couple of ways you can listen to the NBA Playoffs for free online. ESPN radio will be broadcasting select games during the NBA Playoffs, and these games are also available through their online audio player. You can find the schedule of current and upcoming games on espn.com. 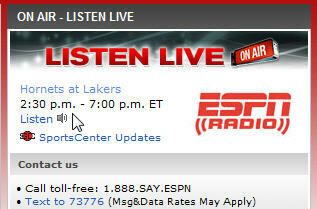 To listen, go to espnradio.com and click on Listen in the On Air box on the right side of the screen. 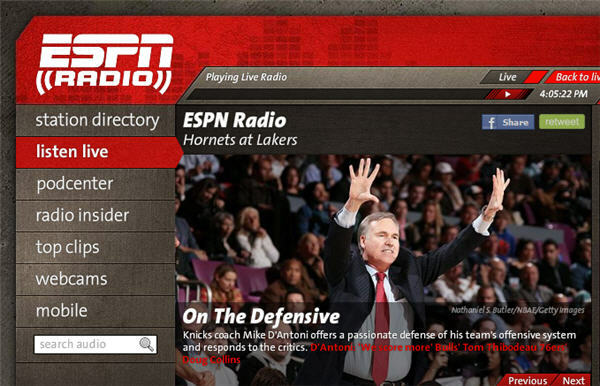 The ESPNRadio player will open and start streaming the audio. 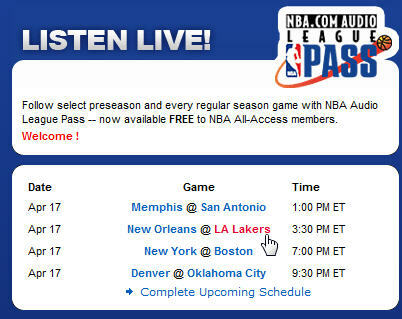 Update (6/2/2011): It looks like NBA Audio Pass isn’t available for the Finals, but all NBA Finals games are broadcast on ESPN Radio and can be heard with their online player. Every NBA Playoff game will be available through NBA Audio Pass. You’ll need to sign up for a free All Access account on NBA.com. 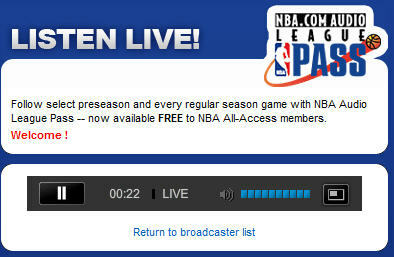 If you already have an All Access account, log in and you can access NBA Audio Pass here. And the player will open up and the audio stream will begin playing.